When people are nervous about acupuncture, it is usually because they associate it with previous experiences of getting a vaccination or having blood drawn. Hypodermic needles are thick and hollow, and the experience can be quite painful. 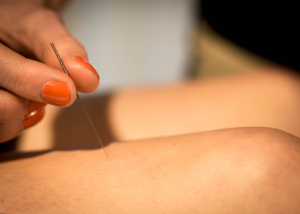 By contrast, acupuncture needles are hair thin; 20 or so can fit into a single hypodermic needle. Most of my patients barely feel the needles or experience a dull pressure which is usually described as strange but pleasant. That being said, people do vary in their sensitivity to needles. Your comfort is of the utmost importance, so during the treatment I like to explain exactly what I am doing, why I am doing it, and what you should be feeling. Likewise, I want feedback from you on the sensations you are experiencing and your level of comfort. Any discomfort should be of the “hurt so good” variety: therapeutic, like that of a deep massage. Certainly not. Our needles are surgical stainless steel, and disposable. We throw them away after each use. In a nutshell, it kickstarts your body’s own healing mechanism by modulating levels of blood flow, nervous system activation, and myofascial tension. Here’s a better answer. You should wear loose fitting clothing so that we can easily access the injured area as well as your lower legs and arms. I expect you to notice a difference in your symptoms in the first 1-2 treatments. Certainly, chronic issues may take longer to resolve. I have no interest in wasting your time or mine; if I do not think acupuncture can help your condition I will tell you up front. Likewise, if I am not seeing the kind of results I expect I will refer you out to get a second opinion. fill out and submit the new patient forms here. You will need to create a username and password to schedule and access the online forms. Follow the link to the patient portal to access new patient forms prior to your first visit. Please submit these at your earliest convenience so that I have plenty of time to read the intake before your appointment. This will ensure that the majority of your session will be spent on your assessment and treatment and not paperwork!